Speedy calibration and repair of all types of sonar. Displays complete receiver, transmitter, and pulse parameters. Production test and calibration of depth sounders. Expanded set of features for design and evaluation of sonar systems. Transducer Test sets for industrial, commercial and oceanographic transducers. Tests transformer- coupled, magnetic, and piezo-electric transducers from 1 to 2500 kHz. 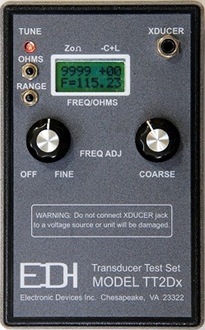 Tests transformer- coupled, magnetic, and piezo-electric transducers from 10 to 2,500 kHz. Checks the transducer, temperature and speed functions. Tests transformer- coupled, magnetic, and piezo-electric transducers from 10 kHz to 1 MHz. High power balanced to unbalanced line transformer 10 kHz to 500 kHz. Provides galvanic isolation between sounder inputs and outputs. Balanced to unbalanced line transformer 20 kHz to 700 kHz. Please E-Mail edisales@bbginc.com or telephone (757) 366-9211 for more information on EDI's product design services. Click here to email your questions or comments to EDI.